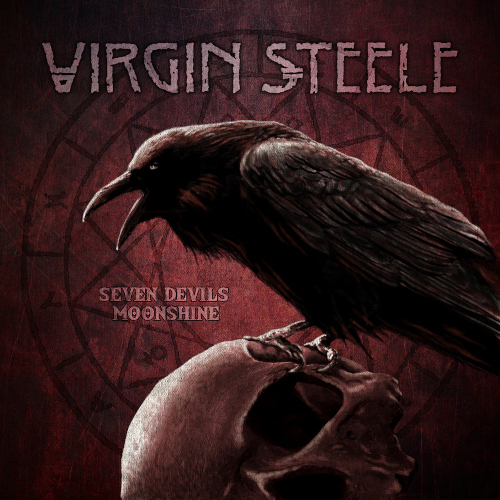 American New Wave Of Heavy Metal legends Virgin Steele have confirmed the release of a very special 5CD box set, 'Seven Devils Moonshine', containing two 'Best Of' CD's and three CD's crammed with new music alongside a 24 page booklet, plus sticker (of the album cover), on Steamhammer / SPV on November 23rd. Vocalist David DeFeis, who founded Virgin Steele in 1981, elucidates: "Cheers, Greetings & Salutations Dear Ever Faithful Eternal Metal Listeners and Friends of the Musical Realm & Written Word Domain! I am putting pen to paper today to inform you all about what we have been doing over the past year and what this Box-Set you are now holding in your hands is all about, its backstory... how we arrived here at this place, and perhaps a bit more about where we might be heading. As some of you may know we have been re-issuing the Virgin Steele Catalogue bit by bit over the past several years, and in doing so we have consistently been adding copious amounts of Bonus Material to accompany all these various re-issue offerings. The last two albums scheduled as part of the re-issue campaign we began, are the albums: 'The Book Of Burning' & 'Hymns To Victory'. When those two albums first appeared they were released simultaneously, therefore we thought why not once again issue them at the exact same time, but... this time let's include a brand new album and create a kind of Box Set package. Well... once we began planning and recording for such an endeavor we very soon accumulated far more material than what could possibly fit on one disc... so... we thought OK fine... we'll plan on releasing two new discs chock full of new material to go along with these last two re-issues... and... shortly after that decision was made, we managed to record even more new material, so now we have in addition to the two re-issues, (which by the way do contain one bonus track each), well Friends we now have actually three brand new discs of VS material included within this special Box Set release! I wish to stress the fact that what we have done here with our Box Set is include 3 brand new albums, not bundle in merely a collection of old bonus tracks we had hanging around for ages and ages... These 3 new discs contain either brand new original songs written and recorded within just these past few months, or brand new re-written covers of songs that we enjoy and felt could be re-cast in the VS style, or... new recordings of classic VS material done either in a special orchestral type setting or stripped way down and re-imagined in vastly different form. Again at the risk of repetition... these aren't tracks that have been sitting around in the vaults waiting... these are all newly recorded tracks completed specifically for this particular Box Set release. I don't know if anyone has ever done this kind of thing before, but we felt that for us it was absolutely necessary to do this, and it makes perfect sense for where we are... at this moment. OK Friends with glass in hand as is only proper as proprietor of the Vineyard, I shall be your guide to this Netherworld and I shall discuss and try to reveal a bit of something about the "Spirit" and "Flavor" of each of the 5 Discs contained within this Epic Box Set we call: 'Seven Devils Moonshine'." CD1 - 'Ghost Harvest (The Spectral Vintage Sessions)' Vintage 1 - Black Wine For Mourning. CD2 - 'Ghost Harvest (The Spectral Vintage Sessions)' Vintage 2 - Red Wine For Warning. CD3 - 'Gothic Voodoo Anthems'. Bootleg Boozer - Roland Hyams : roland@workhardpr.com 020 8677 8466 / 07768 156392. 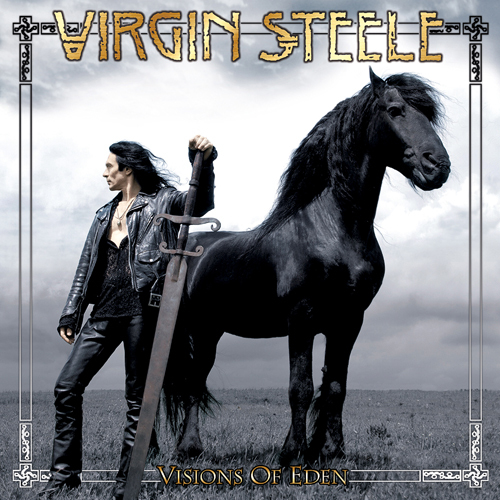 US Barbaric-Romantic power metallers Virgin Steele have remixed and remastered their eleventh studio album, 2006's 'Visions Of Eden', for re-release as a 2 disc digipak CD on February 17th on Steamhammer / SPV. Disc 1 will contain a remixed version of the entire album and the second a remastered presentation of the original album. Contrary to the positive implication of the album's moniker, 'Visions Of Eden' (sub-titled 'The Lilith Project � A Barbaric Romantic \ Movie Of The Mind') does not have a positive message. Vocalist, founder / composer David DeFeis states that "'Visions Of Eden' is most definitely not about happiness, peace, contentment or Eternal tranquility... it is in fact the complete opposite. It is about disorder, strife, struggle, dominance, the annihilation of a culture, the annihilation of a way of Life, and the violation & annihilation of a human being. I have based this Work around the history of the destruction of Paganism, Gnosticism and the desecration & eradication of the Goddess Principle that once dwelt so freely within Divinity. "A massive blow was struck against these early beliefs, by first, the rise of the 'Father-God' principle, and second by the development of 'organized' religions. The 'Visions Of Eden' album concerns Lilith, first wife of Adam, (he of Biblical fame, as in Adam & Eve and the apple, the snake and all that fig leaf and rib propaganda), plus Ancient Sumerian Myths concerning Lilith's relationship with Adam, Eve and God. However, that being said, in actuality, it is really about today... modern times and how we might have arrived here at this strange place we now currently inhabit... "
Virgin Steele, who were formed three and a half decades ago, in Long Island New York in 1981, forged their own magnificent musical path from day one; DeFeis states that "There are three terms I like to use when discussing the Virgin Steele sound; 'Romantic Expressionism', Symphonic Blues Based Metal', and, my favourite, or more appropriately, the one that most aptly conjures up the Sound of this Music in my mind, 'Barbaric Romanticism'. With our music we wish to invoke the spiritual nature locked within all men and women." Prescient - Roland Hyams : roland@workhardpr.com 020 8677 8466 / 07768 156392. 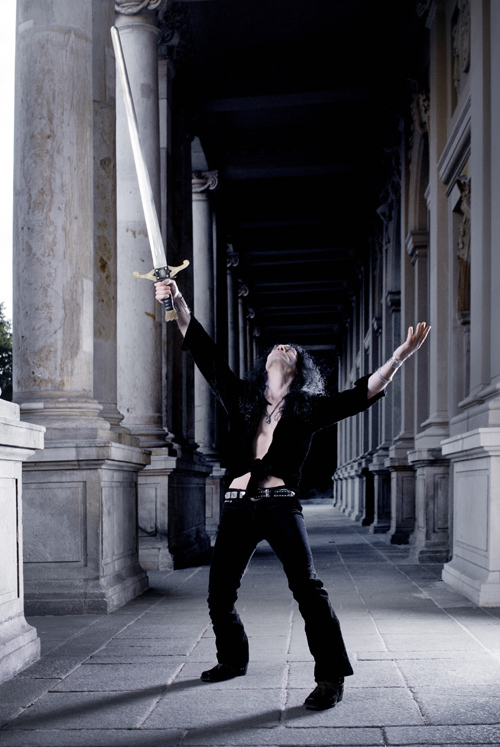 SPV / Steamhammer are proud to re-release US power metal legends Virgin Steele's 'The House Of Atreus Act I & Act II' albums, (originally released in 1999 and 2000), on May 20th. This massive 3 CD digipak re-release comes with bonus material and a huge booklet with new liner notes and unseen photos by vocalist David DeFeis. DeFeis comments; "We are honoured and proud to announce that on May 20th 2016 Steamhammer SPV will re-release our Barbaric-Romantic Epic Metal-Opera 'The House Of Atreus'! It will be issued in a special 3 CD digi-pak format. CD 1 will contain the entire 'Act 1' album, and compact discs 2 and 3 will contain the entire 'Act 2' album, plus the 'Magick Fire Music' Ep tracks. 'The House Of Atreus' was a major milestone release for us and we are excited to have the opportunity to present it to the public once again. In addition to its appearance as a full length album, this work was also presented live onstage as a fully realized theatrical production by the Landestheatre Schwaben, and the tour we completed for it was one of our longest and most ambitious tours ever. Those who might have missed either the album, the tour or the theatrical performance, can now once again experience this work in all its blood-drenched glory and murderous majesty... "
Virgin Steele, who were formed over three decades ago, in Long Island New York in 1981, forged their own magnificent musical path from day one; DeFeis states that "There are three terms I like to use when discussing the Virgin Steele sound; 'Romantic Expressionism', 'Symphonic Blues Based Metal', and, my favourite, or more appropriately, the one that most aptly conjures up the sound of this music in my mind, 'Barbaric Romanticism'. With our music we wish to invoke the spiritual nature locked within all men and women." Steeler - Roland Hyams : roland@workhardpr.com 020 8677 8466 / 07768 156392. 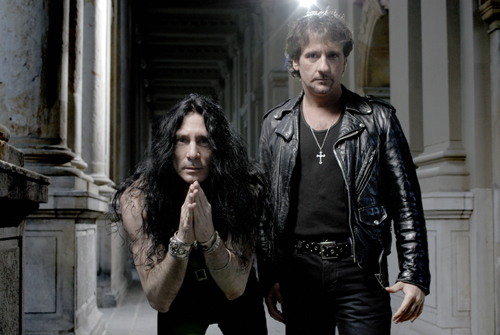 US power metal legends Virgin Steele have confirmed the re-release of their 1994 / 1995 ‘The Marriage Of Heaven And Hell I+II’ & 1998’s ‘Invictus’ albums on June 30th on Steamhammer / SPV. ‘The Marriage Of Heaven And Hell I+II’ & ‘Invictus’ will both be re-released as double digipak CD’s, with massive bonus tracks – some previously unreleased - containing extensive new booklets with rare photos and new liner notes by vocalist David DeFeis. Steely - Roland Hyams : roland@workhardpr.com 020 8677 8466 / 07768 156392.